In the wake of the horrific Christchurch terror attack in New Zealand that left at least 50 killed, a teenager is being hailed by netizens for ‘egging’ Australian minister Fraser Anning, who made Islamophobic comments post the shooting. The incident took place when Senator Anning, a far-right minister from Australia, was addressing a press conference in Melbourne on Saturday. In a video of the incident that has been going viral on social media since, the senator can be seen being smacked on the back of his head with an egg. In the video, the livid senator can be seen violently snacking the teen assailant back. The boy was then violently attacked by Anning’s supporters who beat the boy up before handing him to the police. Many have outraged against the aggressive fashion in which the teen was tackled by Anning’s men, five of whom held him in a vice-like choke hold on the floor till the cops arrived. According to statement made by Victoria police, the incident is currently under investigation. The cops will be looking at the matter in its entirety and investigating the role of not just the teen but also Anning. Anning recently came under widespread criticism after he blamed Muslims immigrating to New Zealand as the reason for the terror attack. Following the egging, the boy who remains officially unidentified, has been hailed as a hero on the internet. Netizens have tracked the teen’s identity from an Instagram account that apparently belongs to him. Many, especially Muslims, have been flooding his the old posts on his account with praise and comments. Even Twitter has been trending with the hashtag #EggBoy where people have been expressing support and solidarity for the boy. People have come up with cartoons, posters and GIFs to commemorate the boy, who many are hailing as an anti-fascist hero. 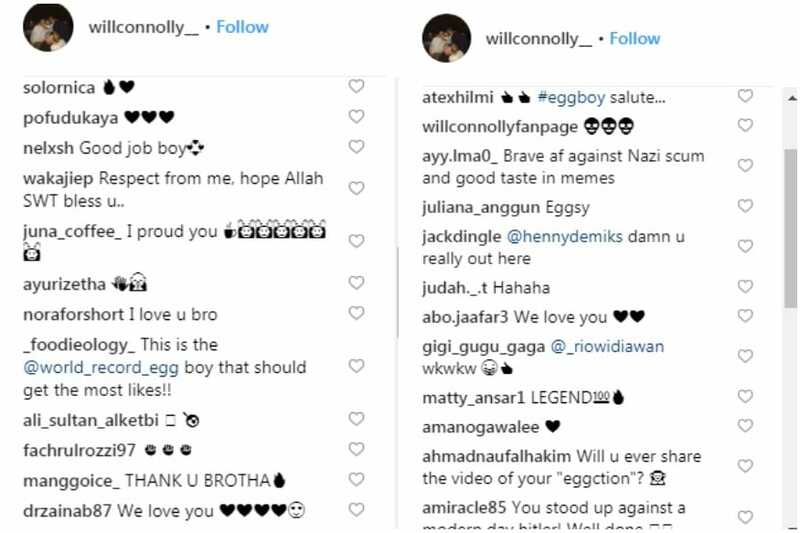 After the incident, the boy, identified by the internet as Will Conelly, posted a vieo on his Instagram account, warning people to not egg politicians unless they wanted to be tackled by their goons. Meanwhile, at least 50 people were injured by the attack that has been condemned by the world as a ‘white supremacist’ and racist attack on Muslims. The accused allegedly e-mailed a ‘manifesto’ — a 74-page diatribe against Muslims, to several persons including the New Zealand Prime Minister Jacinda Ardern, minutes before the carnage.